Is dark energy changing over time? Dark energy accounts for 70% of everything in the universe, and yet we know almost nothing about it. Now a new model meant to explain some impossibly massive galaxy clusters is here, to make dark energy even more fiendishly complex. We're not here to dispute the existence of dark energy — for that discussion, check out Dr. Dave Goldberg's explanation of why dark energy really is essential. But still, dark energy remains a great unknown, something that while we understand what it does — cause the expansion of the universe to accelerate — we don't really have any idea how it does this, or even what it actually is. These are, admittedly, rather large questions to be answered. The best model we have right now for dark energy is the cosmological constant, which simply states that all of space has a certain amount of repulsive energy, and that amount is directly proportional to the size of the universe. So then, as the universe expands, the amount or repulsive energy naturally increases, which forces the universe to move apart — to expand, in other words — even faster. It's still vague on the details, admittedly, but it at least is a straightforward enough model that fits the data we currently have. But Edoardo Carlesi and his team at the Autonomous University in Madrid, Spain have decided to play around with this basic idea. They have simulated a universe where the amount of repulsive energy found in each unit of volume can change over time. This new model is useful, they say, because it can explain how some galaxy clusters reached a mass of over a quadrillion suns when the universe was still only six billion years old, which should be impossibly early according to most models of the universe - there simply wasn't enough time for gravity to pull that much mass together. So how does dark energy help explain this apparent problem? It's all about the ratio of matter in the early universe. In the cosmological constant model, matter could only make up about 27% of the universe's energy density, but under this variable dark energy model that Carlesi has put forward, that number rises to 39%. That difference allows massive galaxy clusters to become much more common, popping up ten times more often in the team's simulations. It's an intriguing idea, and if the cosmological constant model is disproved, then the search for dark energy becomes somehow even trickier than it was before. But there's room for skepticism on this idea. The main problem here is the contention that massive galaxy clusters couldn't form by six billion years after the Big Bang. If those clusters really are as big as they appear to be, then yes, the cosmological constant model would have a lot of trouble explaining how they formed from such a relatively small amount of initial mass. 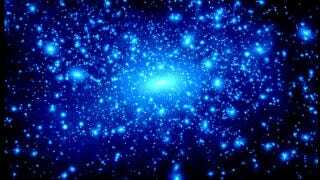 But we don't know for sure that those clusters really are that massive - a lot of their mass is in the form of dark matter, and that makes precise calculations extremely tricky. There's also Occam's razor to consider. Right now, the cosmological constant model has stood up to a barrage of tests that show it can explain a vast array of cosmic phenomena. Right now, this new dark energy model can explain one thing really well — those giant clusters — but we don't yet know if it actually explains anything else, and we're not even sure the thing it explains actually needs explaining. As Michigan physicist Dragan Huterer explains, this is a bit like "using a huge hammer to kill a tiny fly." Still, that doesn't necessarily invalidate this new model, and in at least one area it might well represent an improvement over the cosmological constant model. The key now will be to see how well it does explaining other strange phenomena that require the presence of dark energy. If it does a decent job in other areas, then we might need to start looking at this model a lot more seriously. Via Monthly Notices of the Royal Astronomical Society. Image via NASA.